Farmhouse At Sunset / Evening Rain is one of my hybrid pieces that blends jazz and roots music. It begins as a gentle, reflective, waltz with a touch of a modern Appalachian feeling and then turns into a jazz slip jig. The slip jig (9/8) is one of my favorite forms of Celtic fiddle music. Recorded by Amy Leonard, violin; Jeff Knoettner, piano; E. Shawn Qaissaunee, guitar; and Peter McCarthy, bass. The first section serves as a prelude in setting a reflective mood. Shifting time is used in several places to give the music a feeling of being suspended in the air for a moment. 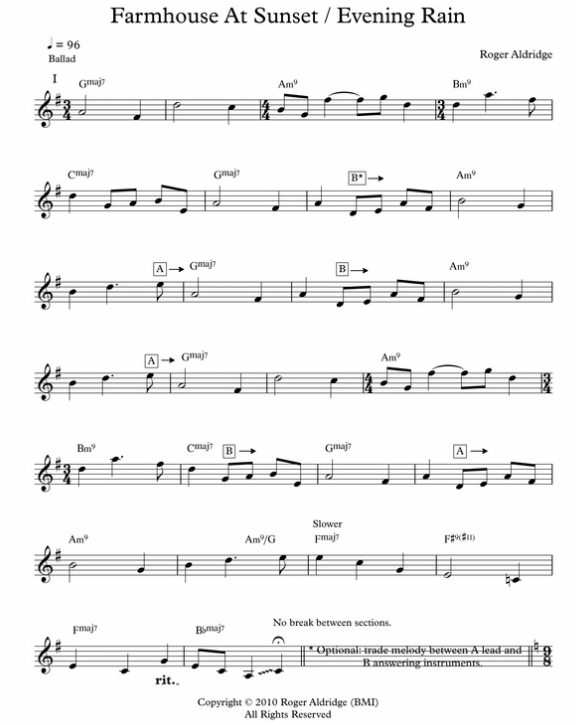 An optional feature in the first section is to have the lead instrument and an answering instrument trade phrases, starting in the 7th bar. This is done with violin and piano on the recording. The second section breaks into a contemporary slip jig. This is unusual music. The 9/8 meter and minor key melody written in a lower range have a feeling of urgency and movement. Structurally, the first phrase is 5 bars, the second phrase is 4 bars, and the third phrase is 6 bars. Unlike traditional Celtic slip jigs, this piece uses contemporary harmony -- focusing on minor 9th and major 7th chords. 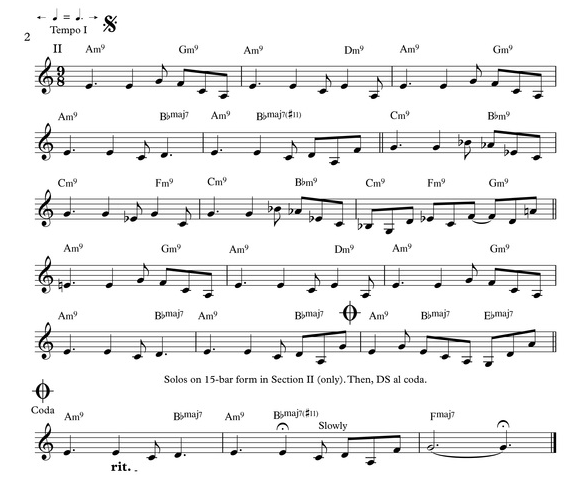 After an optional jazz solo (using the 15-bar form) the second section is repeated and has a coda ending. The first section is not repeated.